AUGUSTA, Maine — Gov. Paul LePage continued building a case Monday against expanding the state’s Medicaid program under the federal Affordable Care Act by highlighting a study that says thousands of younger men, smokers and heavy drinkers would be added to the program nationwide. However, the study also showed that overall, the health of Medicaid recipients after the expansion would be statistically better than it is now. LePage has long stood against expanding Medicaid in Maine, and the debate over whether to do so was one of the top issues of the most recent legislative session. In a media release, LePage cited a recent edition of a publication called the Annals of Family Medicine, which detailed a University of Michigan study about who would receive health insurance through Medicaid if every state accepts the federal government’s eligibility expansion offer next year. The study, which relied on a survey by the Centers for Disease Control and Prevention, says the expansion would result in an increased number of young men, smokers and heavy drinkers on Medicaid. The study showed that the average age of Medicaid recipients under the ACA expansion would go from 39 to 36 and there would be an increase in the number of male recipients from 33 percent to 49 percent of total enrollees. The percentage of smokers on the program would go from 38 percent to 49 percent and moderate and heavy drinkers would increase from 10 percent to 17 percent. The same study estimated that the number of obese people on Medicaid would drop from 43 percent to 35 percent and the number diagnosed with clinical depression would drop from 22 percent to 16 percent. Critics said LePage focused on the aspects of the study that support his argument. Expanding the state’s Medicaid program would provide coverage for about 50,000 adults without children in Maine who earn up to 133 percent of the federal poverty level, or $20,628 for a two-person household. The expansion would also prevent about 25,000 parents and childless adults from losing their Medicaid coverage on Jan. 1, 2014. Christine Hastedt, public policy director for Maine Equal Justice Partners, one of the state’s most aggressive advocates for the Medicaid expansion, said accepting the federal deal would expand the number of services covered in addition to covering more people. She questioned the validity of LePage’s argument about senior citizens on waiting lists for care because much of that care would be newly covered under the expansion. Under the ACA deal, the federal government has pledged to cover states’ expansion costs completely for the first three years and then ramp down funding to 90 percent of states’ cost over the course of several years. But LePage argues that the state should not trust the federal government’s promises and that the expansion would end up costing Maine an additional $150 million in each biennial budget, starting in three years. LePage says he would rather use the funds on other initiatives related to the ACA expansion, such as ensuring that reimbursement rates for primary care and to nursing homes don’t decrease after the federal funding starts to diminish. Senate President Justin Alfond, D-Portland, agreed. “It is time the governor stop using misinformation and fear to pit Mainers against each other and join what doctors, hospitals, the business community, and many others know is the right economic and moral thing to do — expand health care to more Maine families,” Alfond said. House Minority Leader Kenneth Fredette, R-Newport, told the Bangor Daily News on Monday that Democrats have repeatedly stymied debate with Republicans about Medicaid expansion. 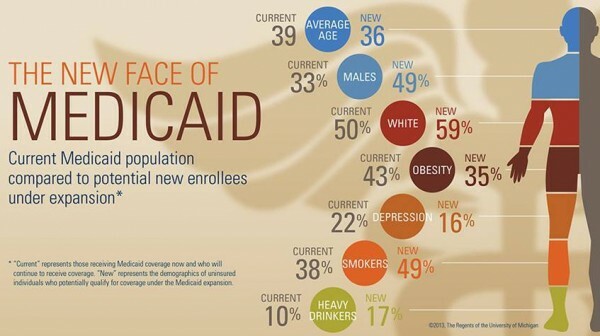 The Congressional Budget Office estimates that 13 million people will become newly eligible for Medicaid in the states that choose to expand by 2022 and the Kaiser Family Foundation has said Medicaid expansion would cost states an additional $8 billion between now and 2022, according to LePage’s office. The Kaiser Family Foundation also estimated that Maine would spend $570 million, or 3.8 percent, less on the state’s Medicaid program if it expanded access, while the federal share would increase $3.1 billion, or 11.4 percent. The foundation also predicted the influx of money would boost jobs and economic activity. According to a poll conducted by Kaiser Health earlier this year, Americans were nearly evenly split in their opinions of the Affordable Care Act, though 71 percent said they support the expansion of Medicaid.